A recipe for Brussels sprouts roasted with fresh lemon and brown butter. Roasting brings out the wonderful flavor and citrus brightens this easy side dish. Melt the butter in a large skillet (oven-proof stainless steel recommened). Continue to cook the butter until it turns a light amber color. Remove the skillet from the heat and let cool to about room temperature. This will prevent the Brussels sprouts from frying when added to the skillet. Thinly trim off the ends of the Brussels sprouts and discard the ends. Cut the Brussels sprouts in half lengthwise. Add the Brussels sprouts and any leaves that my have fallen off into the skillet. Add lemon zest and about 1 teaspoon of lemon juice. Toss to combine and coat with the brown butter. Spread out the Brusssels sprouts to an even layer in the skillet. Sprinkle lightly with salt and pepper. Place the skillet in the oven and roast the Brussels sprouts until lightly browned and tender, about 20 minutes. Some of the loose leaves may be crispy. Squeeze remaining 1 teaspoon lemon juice over cooked Brussels sprouts if a more lemony flavor is desired or serve with lemon wedges. 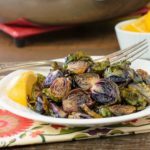 Cooking time may be longer if using larger Brussels sprouts. Also, if using larger ones, peel off and discard the outer leaves.